As luck would have it, I happened upon a yard sale with a ton of quilting books. I just can’t resist these types of books, and even though I have a bookcase full, I had to have them. I love flipping through them and looking at the photos – I almost always manage to find inspiration. And in fact, I already have a lot of pages flagged in these books! and even though it’s really rusty (and probably not good for fabric scrap storage!) it was only $3 so I had to bring it home! How about you? Any fun yard sale finds this weekend? 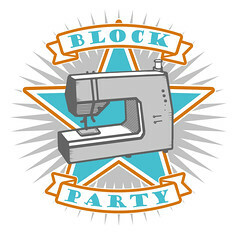 This entry was posted in General and tagged books, collection, enamelware, inspiration, quilt books, quilting books, yard sale, yard sale finds. Bookmark the permalink. I have some of those same titles on my bookshelves. Funny how the colors may not strike me in some of the older books’ pictures, but the quality of the quilt designs speaks to me. if you really do want to use your new bucket for scrap storage, ask your husband to sand down the rust, then spray the entire “thang” with a couple coats of clear lacquer or varnish. shouldn’t be a problem then. Or, you could just get yourself a plastic flower pot that fits snugly inside. That way you maintain the beautiful “antique” that you bought and still make it functional. If I had it, I’d use it for colorful pencil crayons! Or you could even make a little lining for it. But my first idea was to grow strawberries in it! Oooooh, you did good! Have fun with your finds! Nope, nothing that good in a long time. Sigh. I have several of those titles too. When I tried to cull out my bookshelf 6 mo. 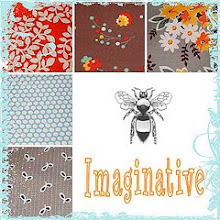 ago I just couldn’t give up the inspiration even though I know I won’t make 99% of the quilts. I did! found a Cubis depression glass cream and sugar set and a stool (I have a little thing for stools)! Just happened to be going by, stopped and it was a most charming yard sale!love the enamel pot! what a find! 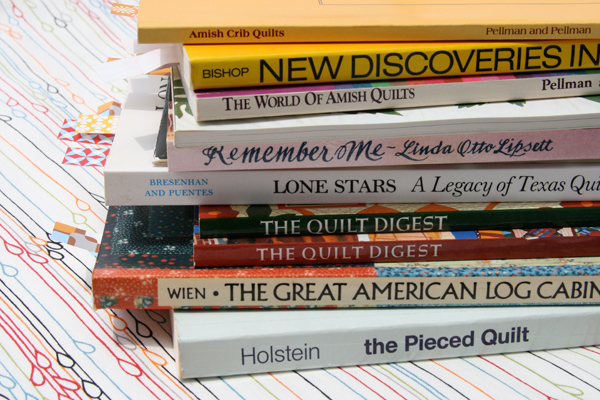 Can’t wait to see if your next quilts are influenced by these books ! I’d be wary of the enamel pot…….it reminds me of the ‘pee pots’ I saw as a child ! Oooh, I bet the Amish book will have tons of inspiration! You got me–I saw a yard sale yesterday but my husband gunned it before I could even say “Let’s stop!” (in all fairness we were on our way home for lunch). How fantastic to find such great books! What exciting finds! For fabric scraps, I currently have my fabric sorted by color in boxes…but it’s hard to SEE what I have. Yesterday I found a dresser on the side of the road in great condition. I have been contemplating moving my fabric in to a dresser so it is more easily accessible, and TA DA! I got a free one! I have a question for the masses: How do you catalog your quilting and craft books? Last year I received all of my grandma’s quilt books (100+!!!!) after she passed away. I am haven’t been able to figure out a â€œsystemâ€. Do I store by subject? Author? Favorites? I am having trouble putting my hands on a book when I need it, and I need a better system than just putting them all on a shelf. Your “new” books look like they were never even used! And your enamel bucket is cool! When my MIL passed away a few years ago, my husband dragged everything home from her house (he couldn’t bear to throw anything out) and I was down in my basement and came upon a similar enamel bucket. It doesn’t have a handle but it has a lid! She used it as a diaper pail for her eight children. After I wash it out thoroughly, it’s going to find a new home in my sewing room. Great finds — I love to look through quilting books and I love the shape of that bucket! How funny is that? Last weekend I bought an enamel pot for the very same reason. The only difference is that mine has red around the rim. Awesome books! They look brand new. I love finding vintage sewing and knitting books and patterns. can’t walk past those lovely books! and you can never have enough of them i say. Love your treasures! I was the ‘provider’ of treasures this weekend. I was the one who had the rummage sale. I hope my customers were are happy with their purchases as you are! 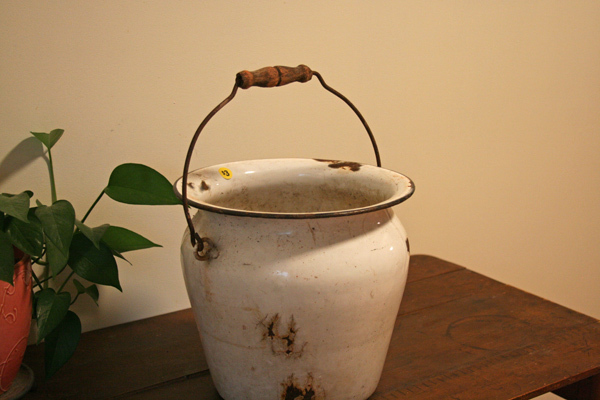 Do you still have the enamel bucket? Would you consider selling it?